Parsuram jayanti is Known as Akshya Trutiya.and lord Parsuram is knowa as a Sixth Avtar of Visnu.Once his father, Jamadagni got angry with his wife Renuka and ordered Parshuram to murder her. 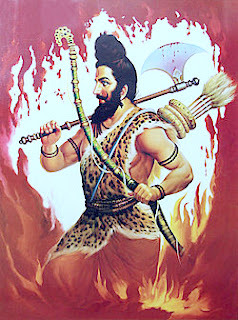 Parshuram obeyed him and killed his mother. Contented with his act Jamadagni asked his son to ask for anything whatever he wanted. Parshuram asked to bring back his mother to life. It was Parshuram’s cleverness that brought back his mother to life again. In this way Parshuram proved his devotion to his father and mother.